With over 100 years of history, the Fort Garry Hotel has played hosts to many guests over the years. One of these guests is reported to haunt the infamous ‘Room 202’. Blood dripping from the walls, figures at the foot of beds, and apparitions walking down the halls are just some of the reports at Fort Garry Hotel. 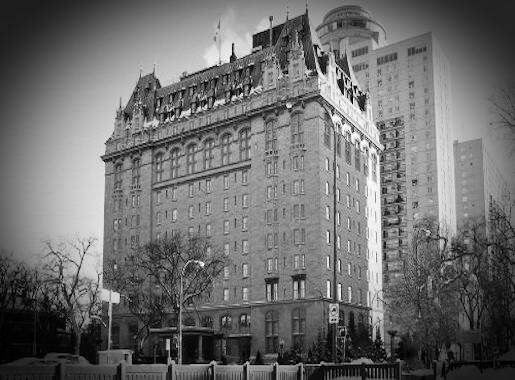 The Fort Garry Hotel is infamous for its haunted Room 202. A woman apparently committed suicide in the room many years ago after hearing of the death of her husband in a car accident. Overcome with grief, she hung herself in the closet. Staff have reported seeing blood dripping down the walls upon entering the room, and guests have witnessed the apparition of a woman in a cloak hovering at the foot of their bed. During a stay in Room 202 in 2004, former Ontario Liberal MP Brenda Chamberlain claimed she was awoken by the sensation of someone getting in to bed with her, twice! A young boy who was on a trip with his family organised by “Make-a-Wish”, wanted to stay in 202. He was fascinated with the whole thing and decided to take some pictures of the room with his film camera. After getting the photos developed a couple months later, all the photos from the trip turned out, apart from the ones in and around Room 202! The boy was said to be thrilled, believing the spirits in that room were just camera shy, and didn’t want to be seen. The woman associated with Room 202 is also said to haunt the hotel lounge. She has been witnessed by staff and guests alike here, often crying in the corner. Staff have also reported seeing the ghost of a young woman dressed in a robe walking down the hallway. Ghostly figures have also been witnessed in other rooms, often at the foot of their beds. Sometimes a man has been seen, and in other instances it’s a woman that has been reported, wearing a ball gown. On one particular occasion in 1989, a hotel employee was cleaning the kitchen overnight. He had gone up the back stairway around 4am, when he heard strange sounds coming from the locked dining room. He immediately went to get the key and upon opening the door he witnessed what looked like the figure of a man sat at a table! He quickly ran to get another member of staff to show them what he had seen, however, when they returned to the dining room, the figure had vanished. The Fort Garry Hotel was built in 1913 by the Grand Trunk Pacific Railway. The hotel was originally planned to be called The Selkirk, however it was decided that it should be named after Upper Fort Garry, which once stood at the junction of the Red and Assiniboine Rivers. The hotel was a real draw from the beginning, and played host to many famous guests, including Queen Elizabeth, King George VI, Laurence Olivier, Louis Armstrong, and Liberaci. The Fort Garry Hotel is now a National Historic Landmark. The Fort Garry Hotel has been providing guests with luxury and relaxation since it opened its doors over 100 years ago. From its imposing exterior to its luxurious interior, the Fort Garry Hotel is the embodiment of grandeur. Guest rooms and suites are finished to the highest of standard, with no expense spared in providing a comfortable yet lavish experience. Fort Garry’s order of the day is comfort, and this is provided in abundance with the renowned TEN Spa, as well as the fine materials used for linens, bathrobes, and towels located in your rooms. As well as the fully serviced TEN Spa, the hotel also boasts a full buffet breakfast, which can be enjoyed in elegant surroundings of The Broadway Room. The hotel’s Palm Lounge is also open for dining throughout the day until late, as well as for drinks. You’ll also get to see live performances every night, and a variety of light culinary fare. Ideally located in the centre of Winnipeg, the capital of Manitoba. The Fort Garry Hotel is within easy walking distance of many of the city’s most popular venues. Staying at the Fort Garry Hotel you’re just minutes away from The Forks National Historic Site & Forks, The Globe Theatre, Manitoba Museum & Planetarium. If you want to experience the shopping in Winnipeg, the Exchange District, Portage Place Mall, and Polo Park Shopping Centre are close by. There’s also a variety of great restaurants around the hotel, just ask reception for recommendations and to make reservations.